There are not so many calories in potato that you should avoid eating them. Potatoes are real food; they are quality food. In moderation they can be real good for you. 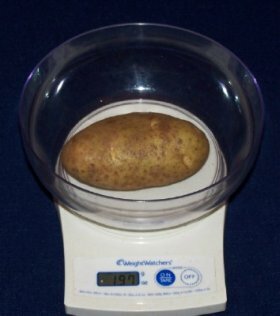 It all depends on the quality and how many calories in potato as to whether or not you can lose weight while eating potatoes. If you look at the chart below you will see that there are anywhere from about 100 to 300 calories in potato. It all depends on the size and how it is fixed. Add more fat in terms of butter, gravy or cheese and there are more calories. First the good news; I have lost weight while eating potatoes. Now the bad news: I would only eat half of a large potato for supper and I would eat the other half for lunch the next day. I do not cook much now and so I can find specials of chicken or a small steak potato and vegetable. Since restaurants give you too much food, making two meals of one made since. Do not forget to check out the sweet potato. It made a good change of pace to the potato and has different vitamins and nutrition than the potato. Just check out how much vitamin A it has! Just a reminder, Vitamin A like vitamins D and E are fat soluble, which means that you do not need them every day. So that one sweet potato has enough vitamin a to last for several days if not a week. If you are thinking of losing weight, consider using water in a soup to moisten the potato rather than butter or sour cream. In this recipe there are about 195 calories in potato soup. This calorie in potato chart pdf might be easier to print.